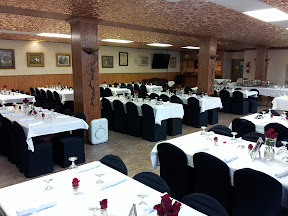 Perfect for weddings, cultural events, private parties, live performances, receptions and gatherings, both large and small..
YOU DO NOT HAVE TO SKIP ALL THE EXTRAS AT THE KLUB HAUS!! We provide all the extras at NO RENTAL CHARGE!! A little girl grows up dreaming of her wedding day with a perfect picture in her mind on how it is supposed to be. Then we grow up, get engaged and become shocked at how expensive everything is. Things become crazy and we get stressed out wanting everything to be perfect but wondering how to pay for it all. A wedding should not put you in debt. Debt is not a good way to start a new life with the person you love. The reception can be the most expensive part of your wedding; the location rental, the food, the alcohol and other beverages, the DJ or band, the flowers, the place settings, etc.. There are ways to cut costs. First of all it is your reception; Do not worry about pleasing your guests. They are supposed to be there to share in your special day, not to critique the food and the decorations. I don't recall caring whether or not they had extravagant decorations or simple centerpieces. That was not why I was there. One of the easiest ways to cut the expense of your reception is to cut all the extras. Unless you can get a great package deal that includes all the bells and whistles, you don't need them. You can choose to have your reception earlier in the day so you don't have to provide guests with dinner. You can have hour devours and finger foods along with your wedding cake. You can skip the alcohol or just have the champagne toast and shots for the dollar dance. Giving shots for the dollar dance works to your advantage because if guests want the alcohol they have to pay to dance with you to get it. Another option is by having a cash bar, let guests pay for their own alcohol while you provide just tea, coffee, or soft drinks. If Uncle Fred or Aunt Jackie wants to get toasted, they can do it on their own dime. If you want to have a dinner reception, ask the staff at the Klub Haus for their recommendations. They can help you find an excellent caterer or other vendors that will fit your budget. Skip the fancy linen tablecloths, china, and silverware settings. I about had heart failure when I found out how much rental for those items would be. (caterers can charge $5.00 per place setting and an additional $15.00 per table for linens!) You can coordinate the plates, napkins, and silverware with your wedding colors and it will look very pretty. Remember, the Klub Haus already stocks all the extras with no charge and will provide everything you need for your reception and dinner. You won't have to worry about returning rentals when you should be enjoying your honeymoon. We have dishware, silverware, glassware, tables, chairs, and all the linens. If you want decent entertainment at no cost to you, the Klub Haus has a professional sound system . You can plug in your Ipod, computer, or play CD's on our player. We can also recommend the most professional DJ service in the Midwest. With modern technology music can be downloaded from the internet and you can play list of certain songs you want played at certain times and make sure they have plenty of your type of music on hand. Give them a list ahead of time so they can download any specific songs you may want. 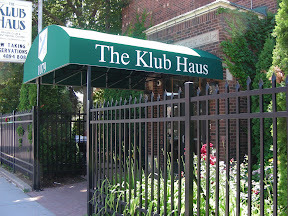 The Klub Haus specializes in reducing costs while having a top flight venue.